AS NIKO KOVAC prepares to make his debut as Bayern Munich’s head coach on Friday when the 2018/19 Bundesliga season starts the club’s former press officer has lifted the lid on life under some of his predecessors. Markus Hoerwick retired in 2016 after 30 years as Bayern’s press spokesman and has given an insight on life under the club’s former star coaches Pep Guardiola, Jupp Heynckes, Ottmar Hitzfeld, Jurgen Klinsmann and Felix Magath. Kovac, Bayern’s new coach after Heynckes retired in May, is bidding to secure a seventh straight Bundesliga crown for Munich, German champions 18 times in the last 30 years. Hoerwick describes current Manchester City boss Guardiola as the “most fascinating coach we had at Bayern”. The Catalan failed to win the Champions League in three seasons from 2013-2016, repeatedly losing in the semi-finals, so Hoerwick rates him behind Heynckes and Hitzfeld, who won the European title with Bayern in 2013 and 2001 respectively. 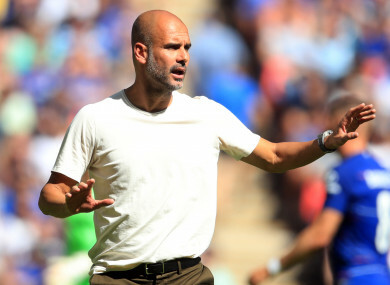 Guardiola won seven titles including three straight Bundsliga titles, but was often at loggerheads with the club’s medical staff over players’ recovery from injury and Hoerwick says training was focused on tactics and skills rather than fitness. “It always seemed to be: warm-up and then play, play, play,” Hoerwick told German weekly Zeit. Hoerwick says the best coaches were Heynckes, who led Bayern in four separate stints, and Hitzfeld, coach from 1998-2004 and 2007-2008, who won 14 titles between them and held players “captivated”. Players and Bayern staff would have “run through fire for those two” and were “out of reach” of other coaches,” said Hoerwick. Hoerwick says Magath is the Bayern coach who struck most fear into his players’ hearts. Magath led Bayern to the league and cup doubles in 2004-2005 and 2005-2006, but was sacked in 2007 with the team outside the Champions League spots. Magath had a reputation for putting players through brutal fitness sessions and was nicknamed “Qaelix” – a play on the German word for torture. “In his coaching days, every player who came to Saebener Strasse (Bayern’s training ground) was afraid of making mistakes, which put the team in the highest concentration all the time,” said Hoerwick. Previous success counts for little at Bayern and Jurgen Klinsmann, who lasted 10 months as head coach in 2008-09 despite having steered Germany to third in the 2006 World Cup, was the most unpopular, says Hoerwick, because of his desire for change. “In the years before Klinsmann, FC Bayern won the double, nothing under him and then won the double again straight away after him – I think that says it all,” said Hoerwick. Email “'In three years with Pep Guardiola, I never saw the team once in the forest or running laps on the training pitch'”. Feedback on “'In three years with Pep Guardiola, I never saw the team once in the forest or running laps on the training pitch'”.